Note from Editor: The core of this article appeared in the South Eastern Pennsylvania Garden Railway Society newsletter in September, 2004. Like the SEPGRS Introduction to Mallets article I posted last month, this one seemed timely in light of new manufacturer offerings. Articulated means two or more sets of driving wheels, one of which can hinge on curves. Compound means a system that uses steam twice, with one set of pistons larger than the other. Mallet means a compound articulated locomotive. Simple articulated means an articulated locomotive that sends the same pressure to all cylinders. The first successful Mallet in the U.S. was B&O’s 0-6-6-0 of 1904. Its success drove many railroads to order Mallets for pulling longer and longer trains. This was the “drag freight” era for railroads, where speed was not as important as train length, and the Mallet fit in nicely. Several ideas were tried to increase power, efficiency, and speed. The Erie tried a 2-8-8-8-2 and the Santa Fe tried flexible boilers. Neither idea worked. In 1919 the Virginian ordered a set of 2-10-10-2’s that was very successful, and had the highest starting tractive force of any steam locomotive ever, 176,600 pounds. Even with large and efficient Mallets, the railroads found a few drawbacks: 1) back pressure caused the front cylinders to lose efficiency over 15-20 mph, 2) the large cylinders and small wheels limited counterweights to balance wheels at lower speeds, and 3) the huge front cylinders meant the railroads needed larger tunnel clearances. Therefore the Mallet was best at pulling and pushing long trains at low speeds. The Norfolk and Western had plenty of need for high-power low-speed locomotives, so they continued to develop their Mallets into successively better locomotives right up to the late 1950’s. One version, the Y-3, was chosen as the basis for Aristocraft’s Mallet locomotive. In 1919 the Pennsylvania Railroad designed a large Simple Articulated that was ahead of its time: when it was used at the front of a train, it broke the couplers far too often. A few years later, in 1924, a tunnel-clearance problem convinced the C&O to try a Simple Articulated with the same basic size of a Mallet but with smaller front cylinders. The concept worked well. Then the Great Northern built a Simple Articulated with larger drivers that could run at much higher speeds. Now the true value of a Simple Articulated was recognized: high power and faster speed. Several railroads, including the Reading and B&O, converted their existing Mallets into Simple Articulateds. Others developed new designs that were larger and faster. The Southern Pacific had a problem with smoke and fumes choking engine crews in tunnels. It solved it by building Simple Articulateds with the cab in the front (Cab Forwards). An example 2-8-8-2 cab forward is shown below. 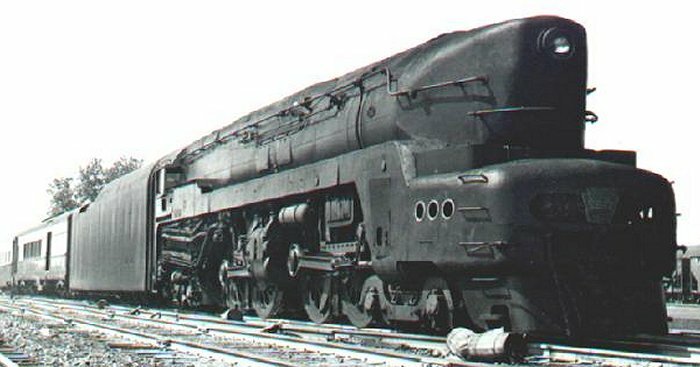 The quest for high power and high speed culminated in the Union Pacific’s Big Boy (below), a huge 4-8-8-4 that could run 70 mph with heavy trains. In the 1940’s the Pennsylvania Railroad experimented with the idea of building engines with four pistons instead of two, so that the reciprocating machinery could be lighter and thus capable of higher speed. They were huge and powerful and looked like articulated engines, but actually had a rigid wheelbase. The freight version was the Q-2 4-4-6-4, the longest and most powerful steam locomotive in the world. The passenger version was a 4-4-4-4, known as the T-1, a handsome and fast engine, easily capable of 100 mph. They were not considered a successful design because of maintenance problems; and they were all retired within 6 years. Several coal-hauling railroads attempted to develop new types of locomotives to use coal as fuel. The Pennsy tried with a locomotive that had a turbine mounted directly to the running gear. The Norfolk and Western tried with the “Jawn Henry,” in which the steam turbine powered a generator which sent power to traction motors at the wheels. The C&O designed a small fleet of similar steam-turbine-electrics. None of these designs worked well enough to compete against the diesel-electric locomotives that were already replacing steam. 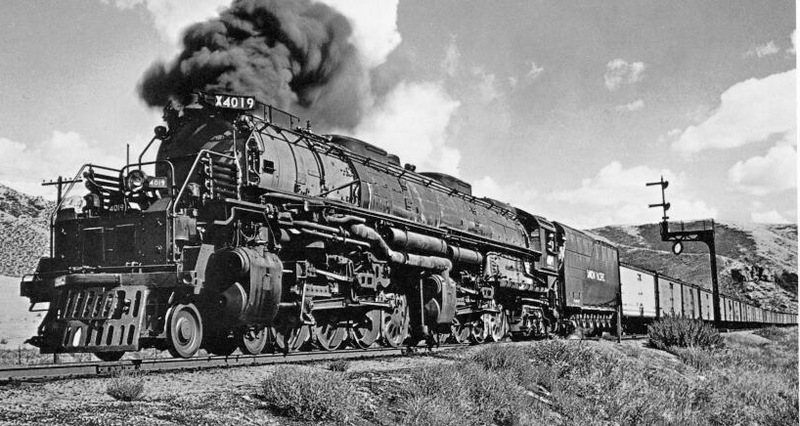 Union Pacific’s Big Boy is often called the largest locomotive ever built, but even if it wasn’t the biggest, it was certainly one of the best. Several are on display, including one at Steamtown. Union Pacific’s Challenger 4-6-6-4 was just as fast, although not quite as large or powerful. Challenger #3985 is still running specials for the U.P., and is based in Laramie, Wyoming. Norfolk and Western’s Class A 2-6-6-4 was a fast, powerful, efficient locomotive used for both freight and passenger trains. Number 1218 ran steam specials until a few years ago. The Norfolk and Western’s Y-class (2-8-8-2) and A-class (2-6-6-4) locomotives were featured in many fine photographs taken by O. Winston Link in the 1955-1960 era. The Southern Pacific owned more articulateds than anyone else, 207, including 195 Cab Forwards. Chesapeake and Ohio’s tough-looking Allegheny 2-6-6-6 was possibly the most powerful steam locomotive ever built. One is on display at the B&O Museum in Baltimore. HO and N have had many mallet models for decades, including Big Boys, and 2-8-8-2s patterned after the N&W Y-series engines. But since my pages serve mostly O scale and larger modelers, here are some articlulated models worth your consideration. Some of them can be hard to come by, as they come in and out of production. But they're all really big fun. The following three locomotives are available in scales running from 1:20.3 to 1:22.5, suitable for modeling narrow gauge industrial or short-line railroads outdoors. Bachmann's Large Scale 2-6-6-2T represents a number of industrial locomotives that were used throughout North America, especially on mining lines, where the trains were short and slow, but often very heavy. It is Narrow Gauge, 1:20.3 in scale. LGB's Uinta Valley 2-6-6-2T is one of LGB's most popular 1:22.5 locomotives ever, recently reissued with a green water tank as shown. LGB's Sumpter Valley 2-6-6-2 is another 1:22.5 example of a light industrial articulated. The following locomotives represent several "common carrier" mainline locomotives that kept up regular operations as late as 1960 on major railroads across the country. They range from 1:29 to 1:32 in scale and are suitable for modeling really big railroads. Hope you have room for really big curves. 10'-diameter curves are the minum, but they all look better on 15'- or 20'-diameter curves. AristoCraft's 1:29-scale 2-8-8-2 is based on a USRA-style Mallet that was popular with many lines, especially the Norfolk and Western. 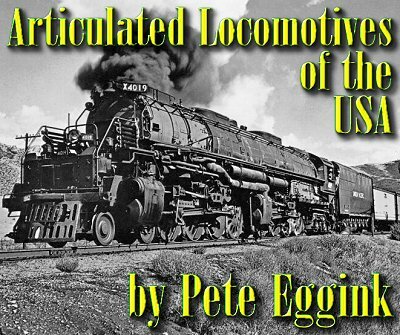 During WWII, N&W had an excess of them, and other railroads were running low on working locomotives, so these found their ways to several other lines for a time. This explains why some of the models are labeled for roads that never ordered these from the factory. This model is reasonably priced, very-well-engineered, and very solid. This model is 45" long counting the tender (which comes in Vanderbuilt or "ordinary" style depending on the road name). MTH's 1:32-scale Challenger was one of their first locomotives in their 1:32 line of "Railking" trains. It is based on a UP prototype that also saw service on other railroads during WWII; a few ended up with Clinchfield after the war. MTH's hope in modeling a locomotive this large was that it would look good even with 1:29 freight cars from other vendors such as AristoCraft. This one and the Big Boy almost do, but they look better pulling MTH 1:32 cars. This model is 50" long, counting the tender. MTH's 1:32-scale Triplex is based on the Mallet with the most wheels. The Triplex was designed to handle huge freight trains, at a time when freight cars and couplers weren't designed to withstand the kind of pulling power the Triplex could offer. In spite of the extra wheels, this is a model of an earlier and smaller locomotive than MTH's Challenger or Big Boy. It would look best pulling MTH 1:32 freight cars. This model is 40" long, counting the tender. MTH's 1:32-scale Big Boy is based on most popular articulated locomotive. This model is 53" long, counting the tender. USA Trains' 1:29 take on the Big Boy is die-cast, 57" long, and about 4X as expensive as the other locomotives on this page. It is scaled to look good pulling AristoCraft or LGB freight cars. Bachmann's On30 2-6-6-2 represents the lightweight articulates that ran on logging, mining and other industrial railroads between 1880 and 1930. It is available in several road names, with or without sound. Note: Several of the Bachmann On30 articulated locomotives are currently being offered at discount by vendors at Amazon. I have provided links near the bottom of this page. MTH's 400AE is a "just-for-fun" takeoff on the famous tinplate 400E. It would be quite at home on any O gauge tinplate railroad. MTH's O-31-capable Allegheny, Challenger, Y6b, and Cab Forward locomotives are die-cast for excellent traction and pulling power. MTH's Y3 2-8-8-2 is a true 1:48 scale model, requiring 072 or larger curves. The following Amazon links take you to some of the Bachmann On30 2-6-6-2 models to help you see what variety is available.